Eventually got round to doing the steering properly with a toothed belt drive, remote feedback pot and friction clutch. 40 tooth pulley to be mounted on top of the steered wheel. 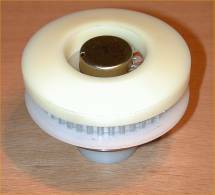 The feedback pot was removed from the servo and is now connected to the steered wheel. 32 tooth pulley connected to the servo. 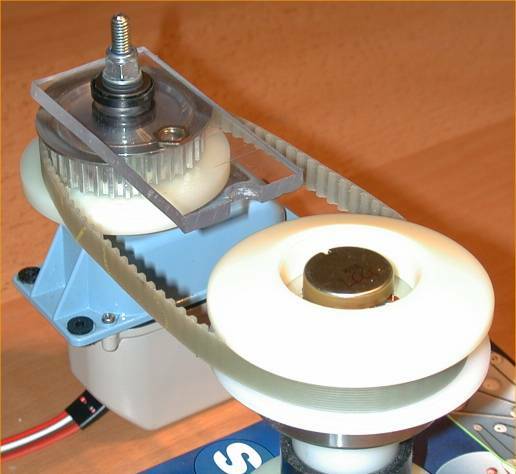 The drive from the servo to the pulley is purely by friction, so that when the wheel hits something, the pulley will slip and rotate (hence the small bearing in the middle) and save the servo. 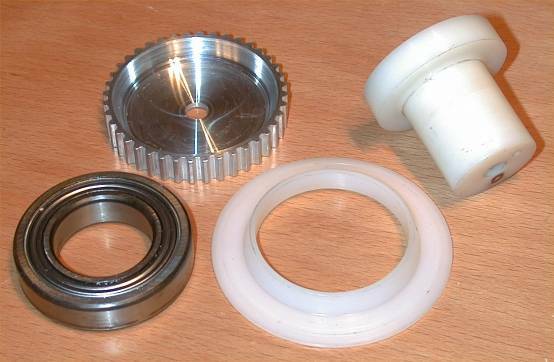 The inside face of the pulley and the underside of the nylon disc on the left, form the two faces of the friction clutch. 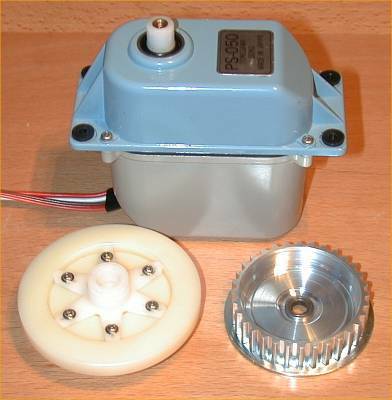 Because the feedback pot is after the clutch, the servo will still try to keep the wheel pointing in the right direction. The assembled system. The nut on top of the servo is for adjusting the friction clutch. The Lexan plate will be mounted to the chassis to adjust the tension in the belt. The servo is rubber mounted, so couldn't do it from there. Used the thrust races from some old model racing cars to allow the plate to rotate freely.